Will Rising Rates Hurt Vanguard High Dividend Yield ETF? Dividend stocks have done well with low interest rates, but will the Fed stop the party? Income-starved investors have turned to dividend stocks as a solution to low interest rates on fixed-income investments, and exchange-traded funds like the Vanguard High Dividend Yield ETF (NYSEMKT:VYM) have been a natural place to get easy access to hundreds of strong dividend-paying stocks in a single investment vehicle. Yet the Federal Reserve raised short-term interest rates in December, and the central bank appears poised to continue doing so throughout 2017. Many investors fear that dividend stocks could fall out of favor in a rising-rate environment, and that could spell trouble for the Vanguard ETF. Still, there are some reasons why the Vanguard dividend ETF won't necessarily be vulnerable to rising rates, and that could reassure investors going forward. Rising rates are a problem for dividend investors because many of the stocks that pay the most attractive dividends are sensitive to changes in interest rates. Many of the favorite industries from which dividend investors pick stocks have relatively few prospects for massive future growth. Because mature companies don't have the need to reinvest the bulk of their free cash flow back into their businesses, they typically return excess capital to shareholders. A stock that has no growth prospects and relies solely on future income expectations in determining its value closely resembles a bond or other fixed-income investment. Therefore, such stocks typically trade in line with the bond market. Rising rates hurt the price of bonds, and so stocks in low-growth industries also often fall in rising-rate environments. Utility stocks provide a good example of this phenomenon. Regulated utilities have some capacity for growth, but their profits are controlled to a large extent by the regulators that oversee them. Rate-setting mechanisms allow utilities to recoup the money they use on major capital projects, and so they can return most of their free cash flow to shareholders. They tend to have above-average dividend yields that are attractive to funds like the Vanguard High Dividend Yield ETF, and so you'll often find utilities as considerable holdings in dividend ETFs. The chart above shows how this works in practice. The blue line represents the share price of a popular utility ETF, while the orange line has prices of a long-term Treasury bond ETF. You can see that the two have largely moved in similar patterns over the past several years, justifying some concerns about rising rates among income investors. Yet there are reasons for optimism among investors in the Vanguard High Dividend Yield ETF. 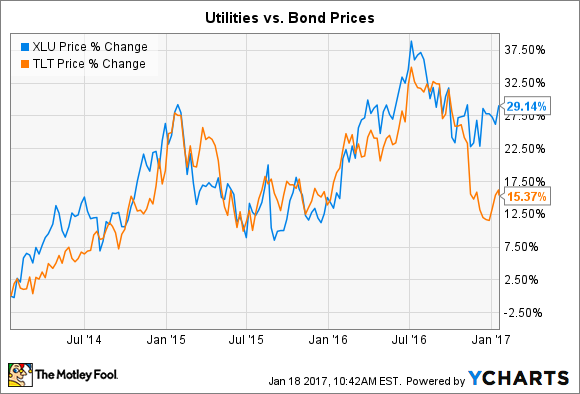 First, notice in the graph above that the most recent drop in bond prices, which corresponds to rising rates, hasn't resulted in a corresponding drop in utility prices. Some policymakers believe that less onerous regulation on utilities could open up new growth opportunities for them. If that happens, then utilities could decouple from the bond market to some extent as investors look for greater growth from them in the future. In addition, the Vanguard ETF holds investments throughout the market, including in sectors that have considerable growth prospects that could make them resistant to higher rates. The ETF's biggest sector concentration right now is in financial stocks, and banks and other financial institutions can benefit from higher rates by widening their net interest margins and lending at higher rates than they pay depositors. Technology is the ETF's second-biggest sector, and although many tech giants have recently embraced dividends, they nevertheless also seek new ways to expand their businesses in a profitable way. Also, big tech stocks have a lot of cash on hand, and deploying that cash in a higher-rate environment can produce more income for them going forward. Perhaps most importantly, long-term investors in the Vanguard High Dividend Yield ETF should look beyond the length of an interest rate cycle in assessing their investments. Even if some dividend stocks do fall as a result of higher rates, the future will inevitably bring both rate hikes and rate cuts. Over the long run, the best dividend stocks will thrive in all environments, and the Vanguard ETF will own its fair share of those stocks. Rising interest rates can be a threat to dividend stocks in the short run. Given enough time, however, investments like the Vanguard High Dividend Yield ETF will get through tough periods and deliver solid returns to long-term investors.